A staple in Midtown’s famed Restaurant Row, House of Brews is brewing up a New Year’s Eve party filled with unbridled revelry and outstanding amenities. Delight in Hell’s Kitchen’s Original Craft Beer, 5-hour premium open bar, live DJ music, and more festivities to heat up your night. 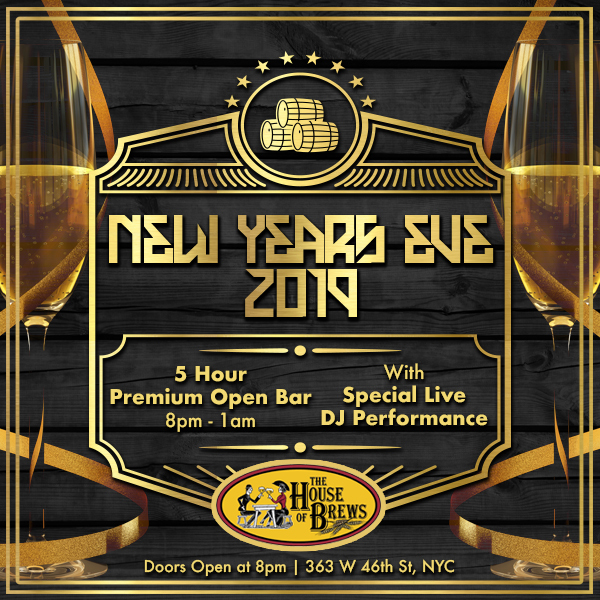 This New Year’s at NYC’s House of Brews, there won’t be a shortage of craft brews, welcoming rustic pizzazz, and the vibrancy that makes New Year’s Eve in New York City truly one of a kind. Head to House of Brews on December 31st for a heavy dose of New Year’s Eve festivity, all starting with a 5-hour premium open bar. In the early evening, delight in a delicious selection of complimentary passed hors d’oeuvres as you ramp up the holiday mood. Enjoy the cozy yet vivacious vibe of this premier venue, and for some party-making heat, a live DJ will be on hand with an outstanding mix of Top 40, Hip Hop, House and Mash Ups, sure to get your heart racing and feet moving. When midnight approaches, grab a complimentary champagne toast and join in the crowd as the DJ leads everyone in an exhilarating live NYE countdown. Add additional punch to the night by opting for one of House of Brews’ VIP tickets, offering table and bottle service and reserved seating. Located on 51st street in Manhattan’s vibrant Midtown, House of Brews is a delightful mix of urban NYC panache and tradition Irish pub charm that’s sure to be a hit this New Year’s Eve. The rustic and welcoming interior features motifs of the brewery, a dart board, and a vivacious party atmosphere popular with New York City’s most fun-loving crowd. Check out the vintage barrels teeming with craft brews, but no matter your drink of choice, you’re sure to have a buzzing good time at House of Brews. If good beers, excellent company, and a great time is what you’re looking for this New Year’s Eve, House of Brews has got you covered. Head to this lively brewery and pub hotspot on December 31st to ring in the New Year with a low-frills, high-energy celebration.